This 70-minute set available from Forbidden Records includes vocalist Rob Thomas, bassist Brian Yale, and drummer Paul Doucette who went on to form Matchbox 20, leaving guitarist Jay Stanley and bassist John Goff behind. A lawsuit has since been filed by Stanley and Goff against Matchbox 20, their producer Matt Serletic and attorney David Mantel. It's a bad situation that will probably get worse before it gets better. 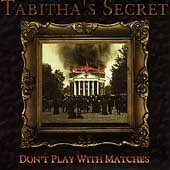 Nevertheless, the music on Tabitha's Secret's Don't Play with Matches may actually be better than the music on Matchbox 20's Yourself or Someone Like You. Two versions of the Matchbox 20's huge hit 3 a.m. are included, and I like the first version on this disc better than the Matchbox 20 single. Perhaps, it's because this version is much more honest and real, while also being far less familiar.